I spend a lot of my free time in the mountains – no matter what the season. Being properly dressed and prepared is critical to my well-being and those in my party, especially in winter. Three cutting edge outdoor clothing brands you probably haven’t heard of do a particularly good job of offering comfort, durability, and style including Ortovox, Kari Traa and Houdini. That’s not to say that some of my favourite outdoor clothing brands like Arc’teryx, North Face, Patagonia, Salomon, Columbia and Helly Hansen don’t do a stellar job but it’s interesting to see where the intersection of creativity and passion leads in some of these less well-known companies. You may have heard of the Ortovox brand if you have spent any time in the backcountry. They are known for their avalanche emergency equipment like probes, shovels, transceivers and avalanche backpacks. 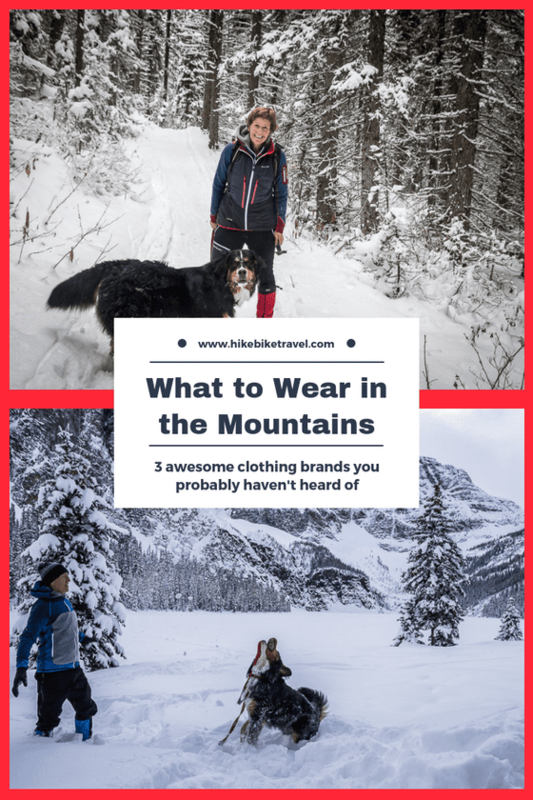 But Ortovox, a Calgary based company, branched into mountainwear for men and women. They offer the full range of layers from base layers to mid and insulation layers. John and I both tested their fleece vest and hoodie. I also tried their Cevedale pant and Bernina jacket on a snowshoeing trip to Taylor Lake where the temperature was probably close to -15°C. What I like is their unique styling of the hoodie with a mix of wool and polyester on the outside, along with wool in the collar and the hood. It’s got a different look than anything else I’ve seen on the market and if John is any judge, it will become one of your go to favourite pieces especially on days when you’re going to be active outdoors. The Grisch vest is lightweight and warm even when it got wet – which it did from sweating on the 2,000 foot snowshoe up to Taylor Lake. I also tried the Bernina Jacket. Pick it up and it weighs nothing yet with warm wool and a windproof nylon outer layer it’s ideal for alpine conditions. For its weight, its second to none – and unlike some of my down products this coat still delivers warmth when wet. I wore Kari Traa long underwear under my Cevedale pant. The combo allowed plenty of movement, kept me warm but I didn’t overheat. The inside has merino wool so if it had been a warmer day you could get by with just the pant. It also comes with a gaiter – which I didn’t appreciate until I got to Taylor Lake. A full line-up of Ortovox products is available at Sporting Life in Calgary and online. On Black Friday no tax will be charged. Me sporting the Ortovox vest, hoody and pant on the way up. No coat needed till the top. This brand which I’d never heard of until a few weeks ago was started by none other than Kari Traa, a Norwegian champion freestyle skier and three time Olympic medal winner. Now she can add “fastest growing sports brand in Europe” to her resume. The brand with the motto “for girls by girls” started with feminine headgear and morphed into a company that now sells everything from underwear to outwear in unmistakably bight colours and patterns. Her idea is to fill the needs of an active, sporty and adventurous lifestyle – words I live by. I picked up the zip top and the rose pant at Sporting Life – and haven’t taken them off since – almost literally. Both were used as a base layer snowshoeing up to Taylor Lake. They kept me warm but I didn’t overheat. I also really liked how they moved with my body, never constricting but always staying up. I’m wearing them around my freezing house with my Louis Garneau skirt and can see that they’ll get a lot of use without going near the mountains! Swedish clothing brand Houdini is known for creating sustainable clothing with great styling for adventure loving people. Its founder, Lotta Giornofelice started the company with small productions of functional underwear that garnered attention in climbing circles. Since then they have evolved to focus on sustainability in a very big way. Their goal as stated is “maximum experience. zero impact.” It’s also a woman led company in an industry that is largely dominated by men. The new addition to my wardrobe is a pair of Long Power Tights. They’re fleece lined so super soft and comfortable to wear. When I pair with their furry fleece hoodie I can manage the temperatures of my horse-hair insulated house. As a Sporting Life ambassador I am privileged to test and try outdoor brands. These are three I can highly recommend. Thank you to Sporting Life for making this post possible.